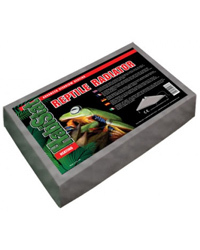 Reptile Radiators are new higher powered heaters from Habistat. They replace the Power Plate and while they maintain the advantages of the old heater, substantial technical improvements have been added. Purpose designed as an animal heater, the Habistat Reptile Radiator will not harm animals, people or fittings if mounted properly. It is specifically designed to direct most of its heat out through the lower, radiating face. Protective insulation minimises the heating of the upper, mounting site. At the same time, even the hottest surface, that which heats the cage, is not so hot that it will instantly burn animals or humans. Carbon Element heater construction gives incredible reliability. This is the same technology that powers Habistat Heatmats. This hot new heater creates an optimal heat density - 75 watts of heat spread over 650 cm3. Most of the heat generated is directed out from the lower surface and the mounting side tends to run at significantly cooler temperatures. It is therefore safer and very economical to run. Size: 210mm (8") x 310mm (12") x 35mm (1.5") deep. Metal safety guards are available separately.